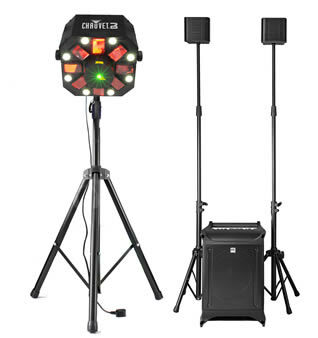 If you are looking for a simple one-stop solution for your party, offering everything you need for both sound and lighting, we offer complete disco packages in four sizes. These have been selected not necessarily as the cheapest option but what we consider to be the best solutions, whilst still bearing budget in mind. We do offer various options to add or subtract from these packages if they don’t exactly suit your requirements. Particularly recommended is the addition of a hazer or fog machine which will reveal the beams of light (subject to venue approval for it’s use). However, if this still doesn’t fit for your event, we are happy to customise these packages to your own specific requirements and will supply a quote accordingly. Our packages are designed to be easy to setup and we give full instruction on how to do this when you collect, along with providing manuals for all components to download from this site. Compact and Small sized discos will fit into most cars. However, Medium and Large packages will require a large estate car, people carrier or small van at minimum. 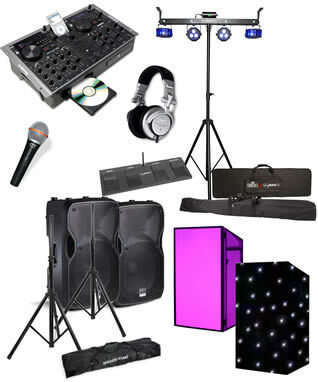 If you don’t require a full disco, but just sound or lighting for your party, please see the Disco Sound Packages or Disco Lighting Packages pages, or the individual component pages. Systems are priced for weekend or weekly rentals. However, we are happy to supply these at a daily rate for single weekday rentals – collected on Monday to Thursday and returned by midday the following day. Please deduct 20% from the Weekend rate. 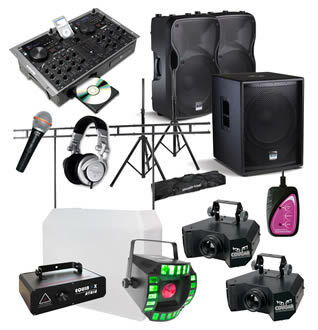 If you would prefer not do anything other than supply the DJ for the event, we offer a delivery and setup service. Delivery will commonly take place the day before the party (but occasionally on the day itself, dependent upon our other commitments) with collection normally the day after. Indicative prices to deliver and setup are listed after the packages, but are dependent upon location. If you would really like a five star service, then leave everything to us. We will come to DJ at your party, supplying experienced DJs and the highest quality sound and lighting systems along with a vast range of music from almost every imaginable genre. Price is dependent upon date, venue location, party size and hours but starts from £380. Please contact us with your event details and we will supply a quote for you. For further details see the DJing section of this website. Whilst we will always endeavour to supply the packages as listed on the website, we reserve the right to substitute components in these packages. Substitutions will be of a similar type and of equal or higher rental value when considered as standalone items. Ideal for a house party with up to about 60 guests. Sound is provided by a high quality and ultra-compact PA system into which you can connect a music source – a smart phone, laptop, tablet, mp3 player or CD player. However you can also connect a CD Mixer, midi controller, digital DJ system or even CDJs and a mixer if you wish to have more control. Lighting is provided by a single fixture on a small tripod but with three separate effects within it. Requires 2 x 13amp sockets. Compact DJ Booth with white frontage. Hazer or fogger to make visible the beams that emanate from the lights. 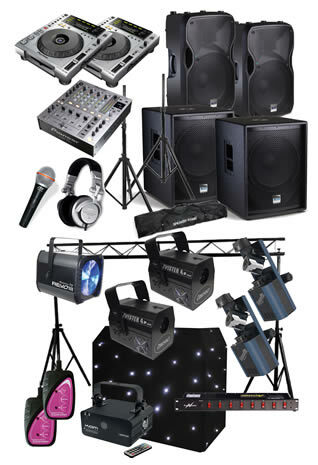 Ideal for a party of up to 110 guests playing standard party style music. Sound is provided by a pair of 12” full range speakers connected to one of our all-in-one DJ CD and mixing consoles. You can connect up to three external music devices (phones, mp3 players, laptops or tablets) to this for mixing between sources or one external source and still use the dual inbuilt CD decks which will play both standard and mp3 CDs. If you prefer we can upgrade to a fully-fledged digital DJ controller or even CDJs (but the latter will also require an upgrade to a full size DJ booth). If you wish to play music with heavy bass – house, hip-hop, dubstep, drum & bass or reggae – then the addition of a subwoofer is a recommended option. Lighting is provided by a single all-in-one fixture, which, although small, contains 4 separate effects, with excellent in-built programming. It also includes a compact DJ booth with white frontage and 0.5m bar to illuminate it or a black LED starcloth (please indicate your preference upon booking). Requires a minimum of two 13amp sockets with one four way adapter (not supplied). Powered sub-woofer (Alto Professional Truesonic TSSub15A or similar) to add extra low end response for bass-heavy music. Requires an additional 1 x 13amp socket. Basic dual wireless microphone system in lieu of wired microphone. Removal of Compact DJ booth. Ideal for a party of up to 160 guests playing standard party style music inside or 120 outside in a marquee. Sound is provided by a pair of 12” full range speakers, plus a 15” sub-woofer, connected to one of our all-in-one DJ CD and mixing consoles. You can connect up to three external music devices (phones, mp3 players, laptops or tablets) to this for mixing between sources or one external source and still use the dual inbuilt CD decks which will play both standard and mp3 CDs. This can be upgraded to a fully-fledged digital DJ controller or even CDJs. If you wish to play music with heavy bass – house, hip-hop, dubstep, drum & bass or reggae – then the addition of a second subwoofer is a recommended option. Lighting is provided by four fixtures, supplied with remote controls for operation or via a switching unit. They are suspended from the overhead lighting bar over the included full sized DJ booth. The DJ booth comes supplied either with a white frontage and 1m LED bar to illuminate it or a black LED starcloth (please indicate your preference upon booking). Requires a minimum of three 13amp sockets with at least one four way adapter (not supplied). Additional powered sub-woofer (Alto Professional Truesonic TSSub15A or similar) to add extra low end response for bass-heavy music. Requires an additional 1 x 13amp socket. Pioneer XDJ-RX professional all-in-one digital controller and mixer in lieu of Numark iCDMix3. Removal of full-sized DJ booth and overhead (lighting now supplied on a tripod stand). Ideal for a party of up to 200 guests playing standard party style music inside or 150 outside in a marquee. Sound is provided by a pair of 12” full range speakers, plus a pair of 15” sub-woofers, connected to an industry standard mixer and a pair of CDJs or a digital media controller that can be connected to a laptop with DJing software or operated via use of the on-board screen with USB drives (please indicate your preference when booking). Alternatively we can supply a pair of vinyl turntables at no additional cost. For bigger events we can upgrade speakers to premium quality 12” tops and/or 18” subwoofers, which give fantastic bass output. Lighting is provided by 6 fixtures, supplied with remote controls for operation or via a switching unit. They are suspended from a winched overhead lighting truss. 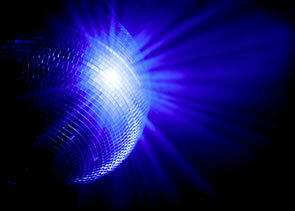 The lighting package can be upgraded to nightclub quality fixtures if preferred. Also included is a full sized DJ booth which comes supplied either with a white frontage and 1m bar to illuminate it or a black LED starcloth (please indicate your preference upon booking). Requires a minimum of four 13amp sockets with at least one four way adapter (not supplied). Yamaha DXR12 premium top speakers in lieu of Alto TS112A speakers. Yamaha DXS18 premium 18” subwoofer in lieu of pair of Alto TSSub15. Pioneer CDJ2000NXS 2 pair and DJM900NXS2 mixer in lieu of CDJ850 pair and DJM700. Premium Night Club Lighting package in lieu of normally supplied lighting. Standard quality dual wireless microphone system in lieu of wired microphone. Downgrade of CDJs, DJ Controller or Turntables for Numark iCDMix3. Removal of full-sized DJ booth.